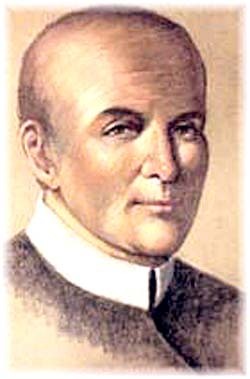 St. Clement Maria Hofbauer was born in Tasswitz, Moravia (now the Czech Republic) on December 26, 1751. In his early youth, after the death of his father, he worked as an apprentice baker. Having become a servant in the Norbertine Abbey at Klosterbruck, he was able to follow the call to the priesthood by completing first his secondary schooling and then his catechetical, philosophical, and theological studies in Vienna, Austria. During this time he made yearly pilgrimages to Rome, where he encountered the Redemptorists. On October 24, 1784, with his friend Thaddeus Hübl, Clement entered the Redemptorist Congregation. Both professed religious vows on March 19, 1785, and were ordained priests on March 29. As vicar general of the Congregation north of the Alps, Clement founded the first house of the Redemptorists in Warsaw, Poland. Other houses were established in Poland, Prussia, Germany, Switzerland, and Romania. He lived in Warsaw from 1787 to 1808, and with the collaboration of lay people of various nationalities, he developed a very fruitful apostolate, promoting good works and strengthening the piety of the faithful. With the takeover of Poland by Napolean, the Redemptorists were suppressed and Hofbauer — forced to leave Warsaw — made his way to Vienna. In 1813 he was appointed rector of the church of the Ursulines. Through the charisms of spiritual direction, preaching, confession, and works of charity, he converted and helped people of every social class. Hofbauer's activity influenced the Congress of Vienna and the culture of the time, especially the Romantic Movement. Clement died at Vienna on March 15, 1820. He was canonized by St. Pius X on May 20, 1909. He is co-patron of both Vienna and Warsaw. The shrine of St. Clement Hofbauer is in the church Maria am Gestade in Vienna, Austria.